Tuesday, June 5, 8pm, £15.50 (concessions £12.50), Pavilion Theatre, Worthing, 01903 206206, worthingtheatres.co.uk. Comedian Tom Allen is touring the UK with his debut tour show. A spokes-person said: “Soaked in Tom’s signature waspish snobbery and self-aggrandising wit, Absolutely addresses the elephant in the room that Tom is still living at home with his parents – because he can’t afford not to – in Bromley, Kent – heart of leave voters and Theresa May’s Brexit Britain. He’s always at home in Alan Bennett and Mike Leigh territory as he shares with us his up close and personal experiences of suburbia, especially since the Referendum. Tom addresses the ‘difficult times’ we live in but were things better ‘back in the day’ when he was kid and you could fit 15 kids in one car?” Tom Allen’s unique style of sharp, acerbic wit and camp, riotous storytelling has seen him perform all over the UK, Europe, Canada, America, Australia and New Zealand. Friday, June 1, £8.50, 11am/1pm/3pm/5pm, The Hawth Theatre, Crawley, 01293 553636. Let’s All Dance present the fabulous family favourite Alice in Wonderland at The Hawth, Crawley. A spokesperson said: “Stunning dancing, much loved characters and super costumes bring the famous tale to life in this magical production. Don’t be late for this very important date! Come and join Alice as she enters the world of the White Rabbit, Queen of Hearts and Mad Hatter.” The show is suitable for all, especially 2-11-year-olds, including children with special needs. 3. The Jive Aces – Jump, Jive & Wail. 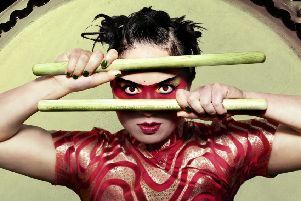 Friday, June 1, 8pm, £19, The Capitol, Horsham, 01403 750220, www.thecapitolhorsham.com. The Jive Aces present their spectacular Jump, Jive & Wail show with special guests Miss Amy Baker and the JiveSwing.com lindy hoppers. Renowned worldwide for their high-energy showmanship, their viral video ‘Bring Me Sunshine’ and for being the first live band to reach the final rounds of Britain’s Got Talent, The Jive Aces have firmly established themselves the UK’s No.1 jive and swing band. The live show features hits like ‘When You’re Smiling’, ‘Mack The Knife’ and ‘Sing, Sing, Sing’, as well as originals like ‘La Dolce Vita’. Saturday, June 2, 8pm, £22.50, The Capitol Theatre, Horsham, 01403 750220, www.thecapitolhorsham.com. This concert offers a nostalgic and fun packed musical journey through the sights and sounds of the swinging ’60s. Audiences can sing and dance along with a cast of fantastic performers to the music of The Beatles, Hermans Hermits, Gerry and The Pacemakers, The Rolling Stones, Cilla Black, Manfred Mann, Dusty Springfield, Lulu, Sandy Shaw and many more. This musical powerhouse of a show covers the explosion of Brit Pop in 1962 up until the era of Flower Power and Free Love in the late 1960s. 5. Jazz Lunch – Shireen Francis. Sunday, June 3, £21.50, noon, The Hawth Theatre, Crawley, 01293 553636. A warm, engaging and soulful performer, Shireen performs her own unique blend of jazz with flavours of gospel, blues, calypso and reggae. The singer is inspired by artists such as Ella Fitzgerald, Dianne Reeves, Carmen Lundy and Etta James. Sunday, June 3, £19.25-£56.25, 7.30pm, Theatre Royal, Brighton, 0844 871 7650. Musical theatre’s leading men and X Factor stars Jonathan Ansell (G4 frontman) and Rhydian Roberts join forces for the first time ever to create a dramatic concert. The evening showcases smash hit songs from the greatest musicals of all time, with classics from Les Miserables, Phantom Of The Opera, Blood Brothers, Wicked, Jesus Christ Superstar, West Side Story, Miss Saigon and many more. Tuesday to Saturday, June 5-9, The Capitol studio, Horsham, 01403 750220, www.thecapitolhorsham.com. The Naked Truth, a sassy, saucy and uplifting comedy, comes to The Capitol Studio, Horsham, this week. When five very different women sign up for Gabby’s pole dancing class, little do they know the hilarious and emotional journey that lies in store for them...or how it will completely change their lives! Whether it’s getting a guy, keeping a guy, escaping from a bad situation at home, or dealing with body confidence issues, each of these women has their own reason for stepping out of their comfort zone and taking up a new challenge. But what starts out as a group of women who are ‘poles’ apart in character and background, soon takes a different direction when one of them gets some devastating news. 8. Larry Dean – Fandan. Wednesday, June 6, £9.50, 7.45pm, The Hawth studio, Crawley, 01293 553636. Fandan is the third hour of stand-up from Amused Moose Comedy Award winner and Foster’s Edinburgh Comedy Award nominee Larry Dean. Hear Larry’s thoroughly unique take on subjects such as ‘pray the gay away’ camps, body dysmorphia and long-distance relationships, which are spun expertly into a tale of an unusual lunch date. 9. Jazz Dance Company – Decades. June 6, 7.30pm, £14, The Capitol, Horsham. Jazz Dance Company explores the glamour of 1920s Hollywood through to the present day, capturing changing eras through the musical styles of the times. Serious, satirical or sassy, Jazz Dance Company showcases a range of styles including hip hop, commercial and contemporary, tap and lyrical jazz. Pic: Peter Teigen. Until June 16, Chichester Festival Theatre, www.cft.org.uk. Nothing will grow for eccentric, high-born Mrs St Maugham in the dry earth of her once grand Sussex garden. Indoors, the situation is even worse. Her wild granddaughter Laurel sets fires and throws tantrums. When the enigmatic Miss Madrigal arrives to take up the post of Laurel’s companion, the household is disconcerted by her evasive oddity.